A key benefit of sustainability reporting is that organizations will be able to track progress and identify areas that need improvement, managing what they measure. When an organization starts reporting its performance publicly, transparency is increased, along with pressure to take action to improve performance in the next report. Moreover, setting numerical targets helps to focus efforts, and drives performance. Once organizations start tracking and evaluating their performance, they can identify areas where they could be doing better. Measuring and reporting leads to exploration, questioning and discovery Tweet This!, which are vital in building consistency between an organization’s “performance” and its “wishes”. 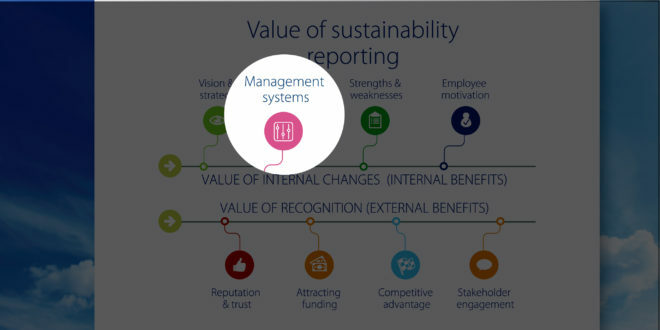 Once sustainability reporting begins, there will be increased expectations from the organization, both internally and externally, for constant improvement. Credibility does not come only from “good news”, but from taking action to achieve goals, especially in difficult areas. The reporting process helps reporting organizations achieve such goals. You have the right to object to this processing or to change the communications we send you at any time.